In addition to tutoring and invitational group instruction, have a number of years of experience in university academia teaching. A good performance. Quite aside from animated gesturing and skillful PowerPointing, there should be a nice demonstration of the physical concept of the day, with more weight on simplicity (easy for students to reproduce themselves) rather than high-tech (costly, apt to failure), e.g. shining a laser-pointer through a CD (diffraction), USB-camera-monitor feedback loop (chaos), and skateboard tricks (F=ma) have brought my classes to life every time. Exciting content. Students must be shown that the physics is not just intriguing, but real and very applicable to their lives. I often show frontier experimental results and connections to other sciences, showing latest news features and interesting science blogs. Special to my situation one year was the devastating 8.0 earthquake in Sichuan --- classes resumed after a few days despite warnings of strong aftershocks, setting the atmosphere for a very animated discussion of earthquake physics such as Omori's Law, S- P- Rayleigh waves, etc. Student participation. This will follow most naturally after 1. and 2. Aside from the traditional demo-participation and question-asking, students might, e.g. make presentations themselves and have team competitions. 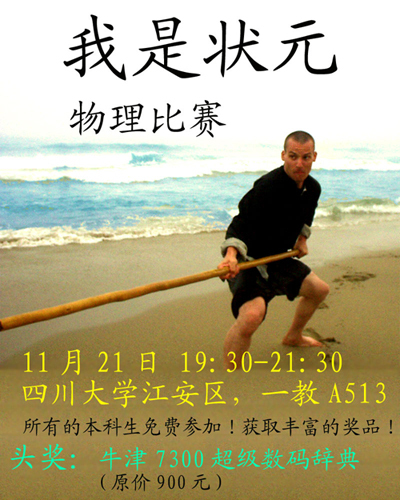 Having taught in both American and Chinese classrooms, where in the former students tend to be stronger in creativity and vocality while in the latter the weight is shifted towards raw knowledge and mathematics, I shape my teaching style so as to produce students with the best features of each. For example, in addition to the usual homework problems I assign, I often add a few Challenge Problems worth extra credit or a prize (e.g. a free dinner for four in a campus restaurant); have a go at a few past problems here! Taking this to the next level, I once held a Physics Competition open to all undergraduates (see poster below). A packed room of not only physics, but also chemistry, biology, and a sprinkling of other majors (take the test yourself here! ); working in an interdisciplinary, friendly competitive environment was something very new to these students.